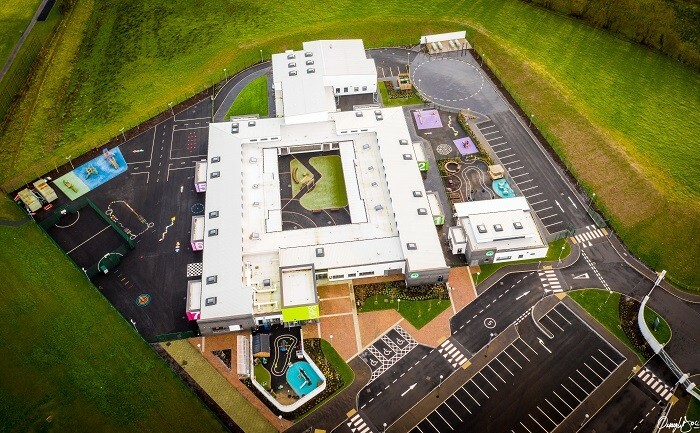 18th of February – TODD Architects have recently completed the newbuild Omagh Integrated Primary & Nursery School, which combined with the adjacent existing Drumragh College, forms the first Integrated Education Campus serving the Tyrone region. 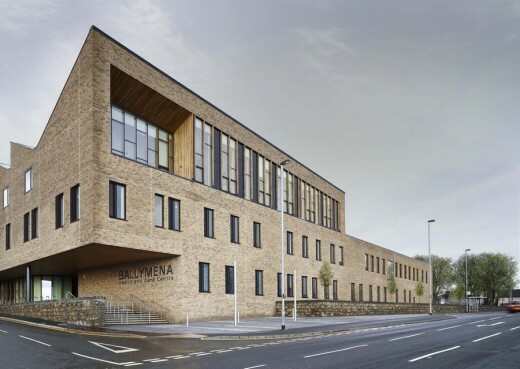 This new addition marks a major milestone for the school and local community, as they have been campaigning for this new building for thirty years. TODD Architects engaged with the school’s principal, teachers and parents to create the most effective, efficient, sustainable design to facilitate flexible teaching needs and to suit its rural context. The school comprises of fourteen classrooms for a capacity of 420 students. Located on a greenfield site on the outskirts of Omagh town, both Primary and Nursery school benefit from a new access road, cycle path, car and bus parking with dedicated drop-off provision. Teaching areas are complemented by generous hard and soft play areas with a central sheltered courtyard & associated landscaping. Internally a resource area provides a key node point to each corner of the courtyard with through access to accompanying multipurpose hall and dining facilities. Omagh IPS was initially established in 1989 and up until the new build was complete was previously housed in temporary portacabin accommodation. During this time the school has grown from strength to strength building on its already renowned reputation for being a child-centred, progressive and parent friendly school, promoting diversity, dignity and respect for all, regardless of race, religion, politics, culture or background. The school also offers a 24 child Nursery class and wrap around extra care services including Parent & Toddler classes, Omagh IPS Friends Pre-School and After School homework club. 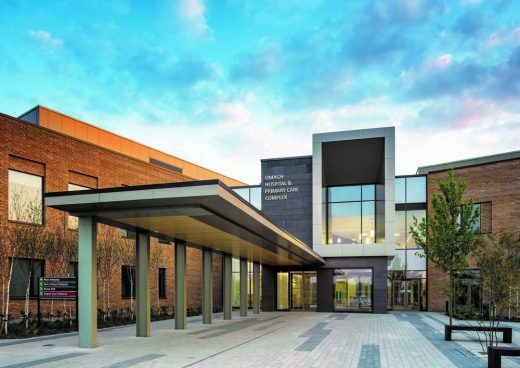 TODD Architects conducted an extensive feasibility study examining the available options for the location of the new building, while focusing on environmental and sustainability factors both in construction and in use. Architecturally the main influences were based on the Classroom configuration developed to follow the progress of pupil’s transitionary cycle from P1 to P7 around the building in an anticlockwise arrangement. Central resource areas grouped around classroom key stages were directly linked to the central courtyard and external learning environment. The continuous circulation loop provided glimpses into the central space and aided orientation for younger pupils. The central courtyard in addition offers sheltered protection from the adverse weather extending the resource area outside. A new entrance was constructed in the first phase of works with site levels extensively remodelled. The material palette was focused on a simple low maintenance and robust elements of Staffordshire blue brick with crisp white painted render both appropriate to the rural context. Internally, the interiors and colour scheme were developed in collaboration with the school, incorporating the seven distinctive colours used as a year group reference and navigational guide for pupils. This was carried through on the exterior with the use of super graphics. The newbuild comprises of a single storey pitched roof design which provides cross ventilation and dual aspect natural daylighting to classrooms, with the multipurpose hall and preschool resource rooms expressed as higher volumes, given their variable purposes. The inner landscaped courtyard offers a multiuse flexible space with low maintenance landscape features which can offer class groups a sheltered external resource and learning area. In terms of sustainability and future proofing the new build has been equipped with high levels of thermal insulation, solar control glazing on south facing facades and enhanced roof structure to permit PV panel provision in the future. These systems are combined with a rain water harvesting tank to flush toilets and an attenuation tank to slow down surface water runoff. Internally daylight lighting sensors and motion sensor switching controls are optimised. These elements reduce running costs and contribute to the BREEAM rating of very good with an air permeability rating of less than 3m3 /m2 achieved. The buildings energy rating (at design stage) is a 25% improvement on notional new building standards. The school has fully embraced this aspect by introducing recycling bins and have been awarded silver Eco status through their own efforts in reducing waste. The scheme started on site in Jan 2017, reaching completion in June 2018, on target and within budget. The new campus has generated a lot of public interest since opening and will provide a destination campus for future generations of children through the learning key stages and life cycle of education. “TODD Architects listened very carefully to what we needed to make our school really work for all its inhabitants. We had a vision of a bright, airy dynamic building that also generated a sense of serenity and order to reflect our Integrated Ethos, and that is exactly what TODD’s delivered. Throughout the design journey, there were of course very many challenges and changes, twists and tweaks, but time and again, the TODD Architects’s team produced creative solutions to complete the brief and satisfy our demanding needs of quality, function, design and aesthetic.